Known colloquially as the “gaping sinkhole,” “drainpipe of the Pacific,” and the “gate to hell,” Thor’s Hole is a must-see natural wonder along Oregon’s coast. Located in the Cape Perpetua Scenic Area, the attraction is a bowl-shaped hole carved into the rough, basalt shoreline. The hole was likely started as a sea cave dug by waves, but the roof eventually collapsed, leaving openings at both the top and bottom through which the ocean surges. At high tide, waves roll underneath the bowl, filling it from the bottom until it bubbles and bursts up in a violent spray. The water then rolls back into the hole, giving it the appearance of an endless drain. The hole, in fact, is only around 20 feet deep. For the best view, go around an hour before high tide or an hour after high tide. The sight is spectacular, and the height of the tide appears to increase the size of the hole and the swells. If you visit Thor’s Well, practice extreme caution. The sudden torrents that occur at high tide can sweep unsuspecting visitors into the well. Drowning is entirely possible, and the rough basalt rock can cause serious injury on its own. On any given summer afternoon, groups of tourists gather around the hole’s rim to peer inside. Photographers arrive at high tide to get as close as they can to this Gate to Hell. While here, be sure to explore the other stunning, craggy features of the Cape Perpetua Scenic Area. This large, forested headland projects into the Pacific Ocean. Managed by the U.S. Forest Service, it is just two miles south of Yachats, Oregon along U.S. Route 101. A high, steep bluff rises out of the ocean; at its highest point. Cape Perpetua rises to over 800 feet above sea level. 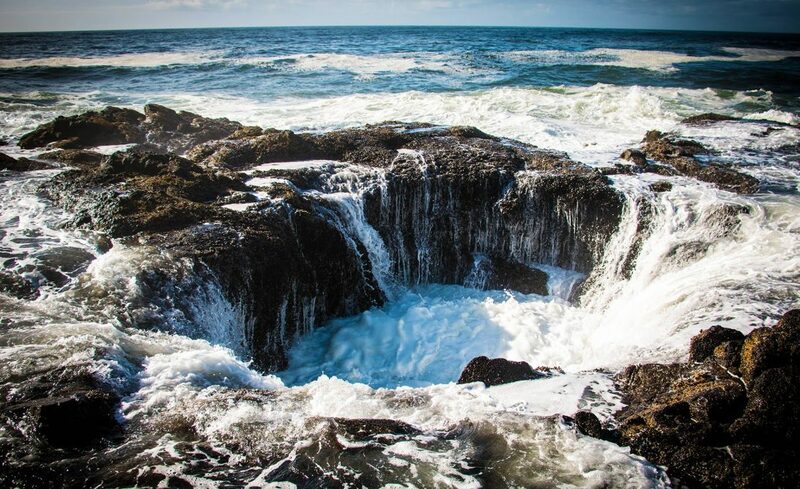 Thor’s Well and Cape Perpetua Scenic Area are essential additions to your Oregon coast exploration.